60% of US thinks Trump either not religious or not religious enough. 51% of country less likely to vote for non-religious candidate. 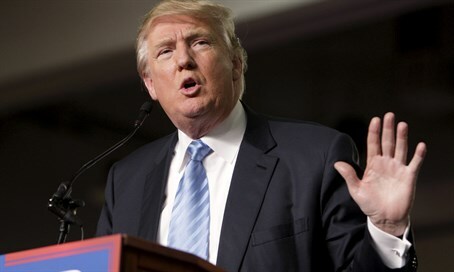 Most Americans do not believe Donald Trump, the Republican presidential frontrunner, is very religious or even religious at all, says a poll released Wednesday. That could be an obstacle for the billionaire turned politician in a country where most Americans say they would be less likely to vote for someone as president who does not believe in God. The poll by the Pew Research Center found that nearly 60 percent of Americans believe Trump is either not religious enough (22 percent) or not religious at all (37 percent). Only 30 percent said Trump, who identifies as a Presbyterian, is religious enough (25 percent) or "very" religious (five percent). Among Republicans, 47 percent don't regard Trump as religious. "The conventional wisdom in American politics has long been that someone who is not religious cannot be elected president of the United States," Pew said. And yet, the poll also found that 56 percent of Republicans consider Trump to be a "good" or "great" candidate. On that question, Trump scored better than Senator Ted Cruz, a Baptist; former neurosurgeon Ben Carson, a Seventh Day Adventist; and Senator Marco Rubio, a Roman Catholic. By far, more Americans see all three Trump rivals for the Republican nomination as religious -- 65 percent, 68 percent and 61 percent respectively. Americans are more evenly divided on the subject of Hillary Clinton, the Democratic frontrunner: 47 percent regard the Methodist candidate as either not religious or not religious enough, while 48 percent believe she is religious enough or very religious. Her main Democratic rival, Bernie Sanders, who is Jewish, is viewed as "not particularly religious" by about 40 percent of Americans, but only 35 percent say he falls short on religion, compared to Clinton's higher numbers on that question. The poll found that 51 percent of Americans said they were less likely to vote for a candidate who does not believe in God, but to 46 percent it didn't matter. Only six percent said they were more likely to vote for a non-believer. "Being an atheist remains one of the biggest liabilities that a presidential candidate can have," Pew said. The poll found some signs of changing attitudes, however. The percentage of Americans who say they would be less likely to vote for an atheist is down 12 points from 2007 in the Pew poll. If the candidate were Muslim, 42 percent of Americans said they would not vote for him or her. But 53 percent said it would not make a difference. Only three percent said they would be more likely to vote for a Muslim presidential candidate. The poll was conducted by telephone among 2,009 adult Americans from January 7 to 14.